Jacob: What are we gonna do after we graduate? Anna: Don’t think about it. Despite a strong cast, familiar, but effective indie sensibilities and soundtrack choices, and a story that does a fine enough job playing with its love story conventions and eventual resolution, the fact that the plot of this film hinges on a really bad decision makes me annoyed by it. 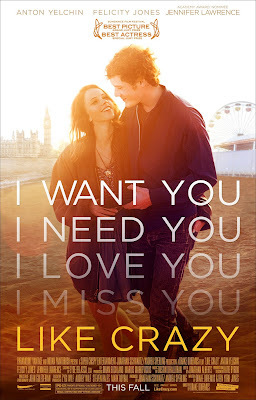 Like Crazy is a romantic drama that involves two college students, one an American and one a British exchange student, who have their love tested when student visa issues keep them separated for long periods of time. It is thanks to the fact that the personal touches added to this story and the work from both the leads and the very small supporting cast is quite strong, that I was able to appreciate what this film had to offer. If the main plot issue I had did not feel so important to me, I maybe would have liked the film more. Anton Yelchin is Jacob, a college TA who catches the eye of Anna (Felicity Jones). Anna decides to move on her feelings and writes Jacob a lengthy letter expressing her feelings. Jacob accepts the offer for a date and the two quickly hit it off. Both are nearly finished with college. Jacob wants to go into furniture design and shows off his artistic design frequently (which includes building a desk chair for Anna). Anna is from England, wants to be a writer, and upon completion of school, she will have to go back to her country, before she can return shortly after. Given that these two have since fallen in love, Anna makes the decision to extend her stay illegally. Following the summer after graduation, Anna returns home for a family obligation. Upon returning to America, Anna is detained in the airport and eventually banned from re-entering the country. This situation puts a huge block of frustration on Jacob and Anna’s relationship. Their relationship becomes an awkward, long-distance one, as the two have little time to see each other. Jacob has developed his own company in the time since graduating, making it difficult for him to travel to England. During all this time, with the time apart that they have, the two do eventually try on new relationships, including Jacob’s relationship with Sam (Jennifer Lawrence). However, as the two do seem to genuinely love each other, making it work out is a challenge that they seem willing to continue to tackle. So right away, my problem revolves around what this story hinges on – Anna’s decision to stay in America, which basically ruins this relationship for the majority of the film. There were no extenuating circumstances, beyond the fact that Anna would have simply have to go back to England for a couple months before being able to return, yet she deliberately chooses to violate her student visa and is punished accordingly. Given that Anna is a very bright girl, a college graduate in fact, the feelings of young love should not have been enough to throw into jeopardy all that she and Jacob had together. Alas, that is what occurs and the situation supplies a very deliberate type of drama because of it. It is manufactured drama, which I did not respond well to and the rest of the film stood on shaky ground for me because of it. Getting away from that aspect, one thing that seemed notable to me is the fact that Anna was definitely more into the relationship that Jacob. If these two truly were in love and had been hurting too much to be apart, Jacob could have 1. Been more direct in getting Anna to go back to England in the first place and 2. Maybe make the effort of trying to start out a life in England with her. Now this second point isn’t a flaw of the film, it is more related to his character. He is a loner of sorts, who really does love being with Anna, but has little in the way of friends or family coming to his support in all of this. Jacob does seem like a good guy, but it also seems apparent that he may actually know the limits of young love. Anton Yelchin’s work in this role is very good. I believed him here, as he had to deal with this relationship, along with the one he tried to maintain with Sam, the other girl, who puts up with a lot during all of this. Felicity Jones has more to work with here as Anna. Her character is the one who is obviously in love and would like nothing more than to have been able to remain in America with Jacob forever (or at least as long as her young desire would carry her). Jones was fairly unknown to me beforehand, but I did like seeing her in this film. Getting past her fatal error in decision making, I saw a young woman not knowing how to deal with a relationship, once it became tested. The distinct persona that she had was interesting to see develop, especially after seeing the relationship she had with her parents in the film. The way this changes over the course of time and how the eventual resolution of the film plays out speaks well to Jones’ performance as an actress. The film was directed by Drake Doremus and scripted by Doremus and Ben York Jones. The two have said to have incorporated elements from their own personal experience into this film, which seems apparent. In regards to the production, it is fitting of its indie status. There are some stylistic touches visually and editing-wise that give this film its own nice identity and the scoring and soundtrack choices were fitting enough. None of the directorial choices felt too overbearing and I am aware that the scripting managed to incorporate a lot of feedback and direct decisions made by the actors involved, so there was a natural sense to how a lot of scenes played out. I do recommend this film overall and I know others can look past the flaw that I hold up with such high cause. Regardless of what I feel is too much of an annoying plot device, I think the lead performances are quite good. I did not really mention Anna’s parents in this film, but they brought a pleasant warmth as well, which was a nice touch. I also did like the way scenes tended to flow. While the film is a drama, I did not feel as if there was too much melodramatic aspects to the proceedings that made the film suffer for it in the way many conventional romance dramas can. As it stands, this is a little indie romance that works well enough. Anna: I thought I understood it, but I didn’t; not really.